The chalcones licochalcone G, licochalcone A, echinantin, 5-prenylbutein, licochalcone D, isoliquiritigenin, licoagrochalcone A, and kanzonol C, were isolated as active principles from the acetone extract of Glycyrrhiza inflata. Two compounds without prenyl group (echinantin, isoliquiritigenin) showed strong inhibitory effects on various neuraminidases from influenza viral strains, H1N1, H9N2, novel H1N1 (WT), and oseltamivir-resistant novel H1N1 (H274Y) expressed in 293T cells. Echinantin (5μM) increased the efficacy of oseltamivir against H274Y neuraminidase. 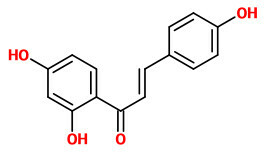 Major components of the volatile oil of G.inflata roots are (E)-2-heptenal, 5-methyl furfural, o-guaiacol, 2-phenylethanol, (4E)-decenal, cumin aldehyde, (E)-anethol, indole, p-vinyl-guaiacol (10%), eugenol and methyl eugenol, γ-nonalactone, β-caryophyllen and its oxide. Special components are β-dihydro-ionone (7%) and 1,10-Epoxy-amorph-4-ene (12%).